Pacific Child & Family Associate, a provider of behavior analysis services for children and adults with autism and other developmental disabilities, has announced the development of the Sans Siri Society, a society that helps decrease dependence on interactive technology and creates opportunities to make genuine connections between individuals with autism who are of similar age and who share common interests. Building and maintaining friendships is one of the biggest hurdles for many people with autism spectrum disorder (ASD) due to communication and comfort obstacles. The iPhone’s Siri and other interactive technology have given these individuals the opportunity to avoid some of the obstacles they experience with personal interactions, but it comes with a social price. The more a person with ASD interacts with technology, the more likely they will be to build barriers to real life conversation, thus losing the opportunity to build upon existing relationships and skills involving communication, behavior, or interaction. This outcome hinders not only friendships, but education, employment, and everyday activities. Participants of the Sans Siri Society are volunteers without ASD who are vetted and coached to understand ASD and their new potential friend with ASD. They must be willing and available to talk, share stories and provide an opportunity for social engagement and also be open to feedback and instruction. After communication between individuals occurs, Sans Siri Society members must be able to provide options for “store and forward video” and the deconstruction of the social interaction. Parents monitor the first few telephone call interactions and then special precautions are put into place. After this, the volunteer can continue to participate in conversations with the individual with ASD and also give feedback to their new friend to help them better understand where they are excelling from a social perspective. 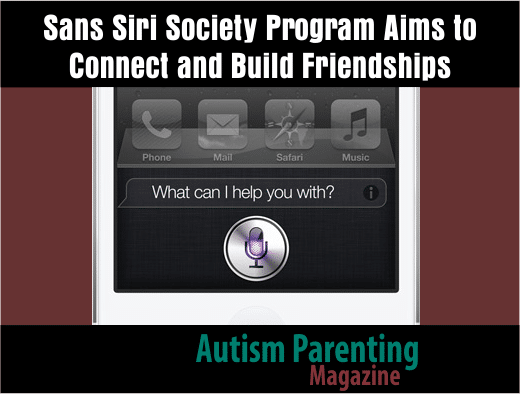 For more information about the Sans Siri Society and how to take part, call (844) 599-5588. ABOUT PACIFIC CHILD & FAMILY ASSOCIATES Pacific Child & Family Associates offers clinic based, in-home, and at-school services that include applied behavior analysis, parenting training and speech therapy for children and adults with autism and other developmental disabilities. They currently have offices throughout California, New Mexico, Minnesota, Texas and New York, and are actively expanding to other areas of the country. Pacific Child & Family Associates are committed to providing the highest quality, scientifically-based services built on a foundation of respect for its clients and its employees. To learn more, visit http://pacificchildandfamily.com, www.facebook.com/PacificChild, and www.twitter.com/PacificChild.